Aspen Ridge embodies so many of the quintessential Colorado Mountain Retreat amenities – an ideal location, amazing mountain views, a spring-fed pond (with water rights), rolling meadows framed by tall stands of fir, spruce and aspen trees reaching towards blues skies, a well-developed walking trail that explores the acreage, resting benches, campfire rings, an open pavilion and labyrinth that take in the scenery, log cabins (fully restored and ready to use) tucked into the trees and a magnificent lodge complete with a timber-framed great room, wood-burning fireplace, commercial kitchen and (3) master suites. 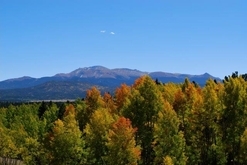 The Property is graced by picture post card views of three prominent mountain ranges: Pikes Pike, Sangre De Cristo, and Tarryall Mountain and the rich colors of summer blue skies, evergreen trees, the shimmering golds, oranges and reds of Fall, and Winter’s pristine blanket of white. Activities of all seasons can also be enjoyed in this region – nature hikes in boots or snowshoes, horseback riding or sleigh rides, wildlife viewing to world-class hunting and fishing. Wow - so many possibilities! 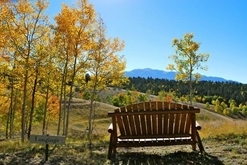 Continue a charitable, ministry-based business or make it a private family or corporate retreat that has the option of year-round, income producing (rentable) accommodations. The property has no covenants, is fully fenced, cross-fenced and less than 20 minutes to Woodland Park - a quaint mountain town located in the heart of central Colorado, just west of Colorado Springs. Numerous nearby attractions await the explorer in each of us – Pike National Forest & BLM Lands, Scenic Byways leading to historical gold mining districts, small stakes gaming/melodramas, small town fairs and art festivals, reservoirs for boating and fishing, rivers for white water rafting and fly-fishing, or mountain resorts for all the snow-packed fun you can handle! Aspen Ridge could be the place to make your dreams a reality!